Postmodernism: Decoration and appropriation, the return of narrative and content. Watching video in class: From "This is Modern Art" Series with Matthew Collings, Channel 4, 2000 - Episode 1 "I am a Genius"
"The Postmodern Sublime - Installation and Assemblage Art" by Paul Crowther from "Art & Design - the Contemporary Sublime - Sensibilities of Transcendence and Shock" (1995). Postmodernism, like modernism, follows most of these same ideas, rejecting boundaries between high and low forms of art, rejecting rigid genre distinctions, emphasizing pastiche, parody, bricolage, irony, and playfulness. Postmodern art (and thought) favors reflexivity and self-consciousness, fragmentation and discontinuity (especially in narrative structures), ambiguity, simultaneity, and an emphasis on the destructured, decentered, dehumanized subject. But-while postmodernism seems very much like modernism in these ways, it differs from modernism in its attitude toward a lot of these trends. Modernism, for example, tends to present a fragmented view of human subjectivity and history (think of The Wasteland, for instance, or of Woolf's To the Lighthouse), but presents that fragmentation as something tragic, something to be lamented and mourned as a loss. Many modernist works try to uphold the idea that works of art can provide the unity, coherence, and meaning which has been lost in most of modern life; art will do what other human institutions fail to do. Postmodernism, in contrast, doesn't lament the idea of fragmentation, provisionality, or incoherence, but rather celebrates that. The world is meaningless? Let's not pretend that art can make meaning then, let's just play with nonsense. Perhaps in the same way that the Dada Movement of the 1910's-20's inevitably self-destructed (Dadaist: "There are no rules!" Response: "Uh... is that a rule? "), Postmodernism's nihilism is problematic. If nothing is original, and if nothing has any sincere meaning, then you may well ask, why would one bother to make anything? Hence the rise of the anti-hero art celebrity. If nothing means anything, and there is no such thing as true creativity, then what reason is there to create apart from an attempt to project one's own self? Appropriation is another significant Postmodernist idea. If nothing is original, then why not just steal shamelessly? Pastiche, collage, deliberate reworkings of reworkings of other people's words, art and ideas. Another catch-prase of Postmodernism is deconstruction. This would establish that their revolutionary social theory was not, in fact, terribly original. This would also indicate that there was no future for postmodernism—either in theory or practice. In Michael Gonry's video for Bjork's song Bachelorette, the idea of a Simulacrum is explored. As a book she finds in the forest (entitled "My Life") becomes published and her popularity rises, the sincerity of both the book and the accolades it receives diminishes, shown by the increasing size of the book at the hands of the dodgy Agents and Publishers, and the increasing artificiality of the audience and environment. The world around her becomes a theatrical set with the people around her no longer those she knows, but actors playing their parts. Matthew Barney's "Cremaster" series of films are an excellent example of Postmodernism in Fine Art. On a more practical level, how about Postmodern Design? This breaking away from Modernism's ideal of perfect forms is a significant turning point in design, and has become the basis for a new aeclecticism. The cultural turn implicit in Postmodernism challenges the assumption that the object of study can be an autonomous entity – it is said that an object is not able to speak for itself, but is in fact 'spoken for' by its social and political context. The values associated with the object are determined by the position from which the object is viewed and aesthetic appeal is regarded not as a universal value, outside of history, but rather as an ever-changing quality relative to the circumstance within which the object is consumed. 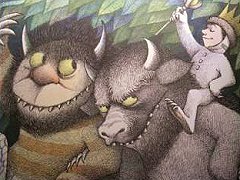 In consequence, the true nature of things is to be found in social processes and structures that surround them, rather than in an intrinsic, immutable quality of the things themselves. This view challenges the authority of the designer’s decision making. Rather than there being one ideal aesthetic solution to a design brief, there is an acknowledgment that different solutions exist for different circumstances. Instead of being based on an absolute judgement, the aesthetic preference of both the designer and the consumer is a socially determined. Their taste judgements are founded on a complex set of factors including their class, educational background, and location. In other words, there is no ‘correct’ form for an object, but a number of different possible forms, with their legitimacy being dependent on the historical conditions of their reception. Some objects may acquire several different meanings in their lifetime, according to how they are used and displayed. For instance, for a student to own and display a 1970’s airline bag is more likely to be an ironic statement about how cool they are, than an indication that they are a seasoned air traveller. The meaning of the bag is dramatically changed by the context within which it is viewed. 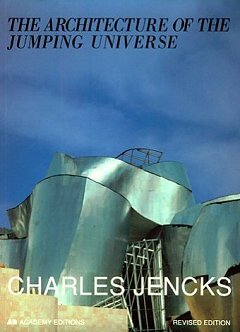 British architect and author of ‘The Architecture of the Jumping Universe’, 'Garden of Cosmic Speculation' books on Postmodernism in Architecture. Jencks has been a theorist (and practicing architect) in the field of Postmodernism since the late 1970's. American Pritzker Prize winner of 1991 and Postmodern theorist in the field of architecture. "Architecture is a profession about wood, bricks, stones, steel and glass. It is also an art form that is based on words, ideas and conceptual frameworks. 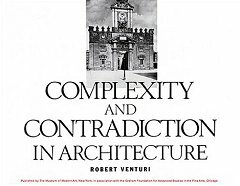 Few architects of the twentieth century have been able to combine both aspects of the profession, and none have done so more successfully than Robert Venturi. Architect of the AT&T Building in 1978. "Philip Johnson's design for the AT&T Headquarters (now the Sony Building) in New York City was the most controversial of his career. 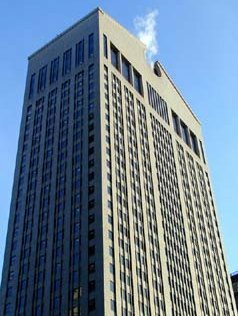 This otherwise sleek skyscraper, built in the International Style, was adorned with a baroque pediment that was scornfully described as the "Chippendale" top. Today, the AT&T Headquarters is often cited as a masterpiece of postmodernism.